The Tapestry is a large rectangle(5'by 4') with the centre section picturing six scenes - the Church, the Old School, the War Memorial, the Village Hall, the White Horse, and the Bridge. 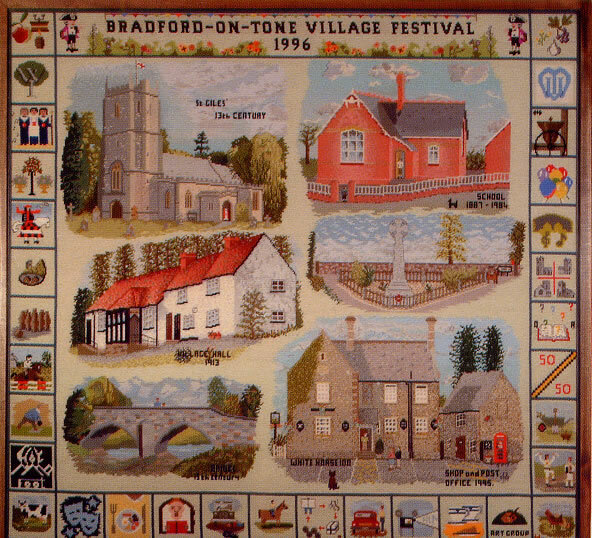 Round the edge are 32 squares, each one depicting a club, society, or business in the village in 1996, the year in which the village started to raise money to enlarge the Hall. Jane and Keith Dyer planned the tapestry( the plan, on graph paper is a work of art in itself), assembled the materials- the canvas and the myriad wools and set it on a tipping frame about 6 feet square. By the Millennium it was well under way and three quarters worked, largely by Jane. Then came a lull of about two years. Work having recommenced in 2002, the project was finally completed, and went on view on 8th February 2003 in the Village Hall where it now hangs.